With Eva’s European Tours you travel in style and personalised attention! Thank you for a wonderful, magical tour. We never had to concern ourselves with anything knowing that we were in good hands. It exceeded our expectations and we look forward to meeting you again. Piestany to me is the highlight of my year, the spa treatments are relieving all my arthritis pains and keep me pain free. I do not need to take medication like I use to. Also for my husband this is the most relaxing time as Eva is the most experienced Tour Leader who makes sure we have a hassle free holiday. John and I would like to thank you so much for the wonderful experience of the tour. Your expertise and care for all of us was beyond exceptional. The hotels, tours, food, local knowledge, currency information and companionship was more than outstanding. What a wonderful holiday! Thank you so much - I enjoyed it immensely, largely because of your expertise, attention to detail and professionalism, and in making sure everything ran smoothly and on time. My fellow travellers were a joy to be with. For those who regard themselves as travellers rather than tourist, Eva’s European Tours will prove a godsend. Eva, you cover all the bases with grace - a jump ahead of us all, anticipating our needs and reading us as a group like an open book. What a wonderful three weeks. Thank you for a superbly rich and varied set of experiences. I have been on six other tours with different companies, but this one I enjoyed the most! Thank you for the special experiences - cultural and historical. Truly memorable, which sets your tour apart from the insipid and mundane. Wonderful, splendid and unforgettable. 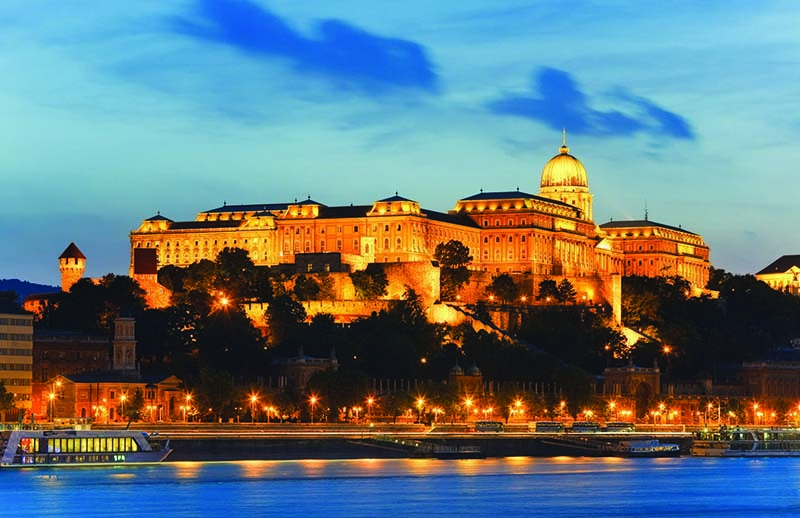 Enjoy holidays unlike any other on the Full-board Mediterranean Cruise followed by relaxing and re-energising stay in Hungarian spa town of Heviz and finish in Budapest stretching along the banks of the Danube, representing two different characters of the city. 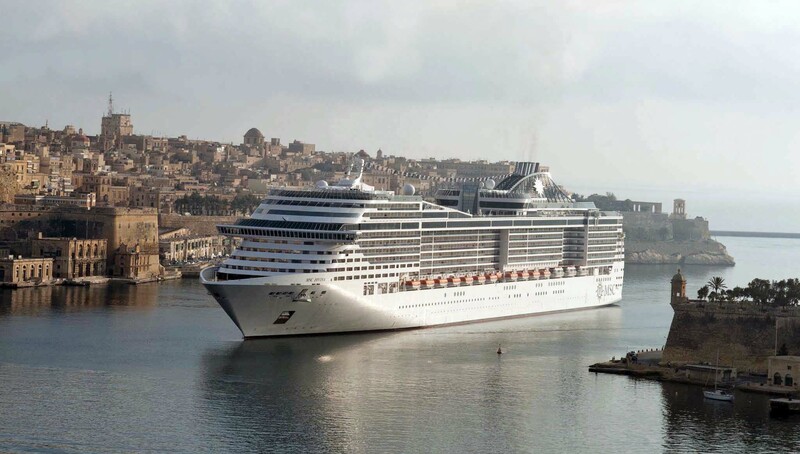 The Tour is designed for travellers wanting a more relaxed holiday, exploring parts of Europe on the brand-new “MSC Bellissima” with state-of-the-art features, the indoor promenade with shopping arcades, restaurants and fabulous shows featuring Cirque du Soleil at Sea. Pair your cruise with 14 day stay in the most famous of Hungary's spa towns , staying at the wonderful hotel, enjoying delicious food, walks in the very friendly town, shopping, music etc. This long indulgent stay includes no less than 33 pampering spa treatments. Depart from Australia for Milan from where we transfer by coach to meet our ship in Genoa. Enjoy the seven-night Mediterranean cruise in an ocean view cabin with a range of activities and meals included. Explore ITALY, SICILY, MALTA & SPAIN where you will discover varied cultures and something new every day. After disembarking from Genoa you will be transferred to Genoa airport for your flight to Budapest. In Budapest you’ll board the coach to Heviz. 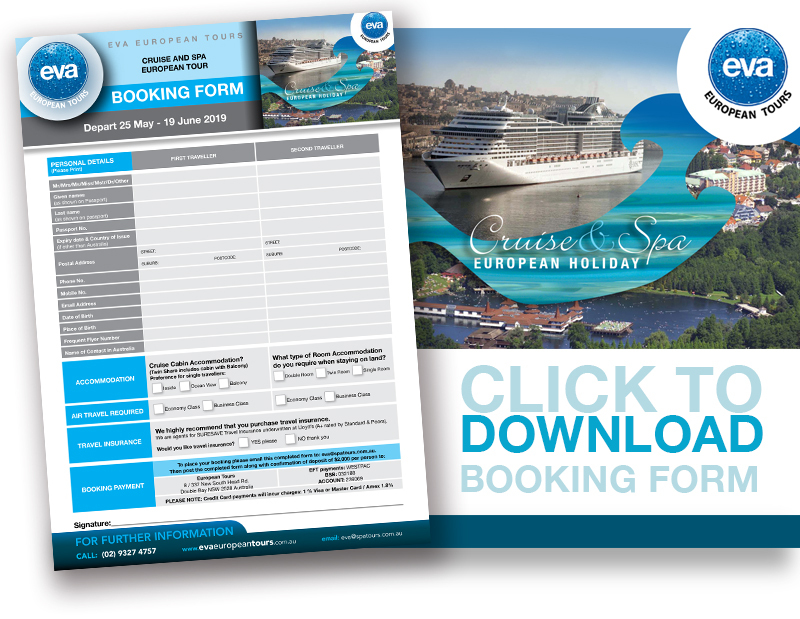 To book simply download the Booking Form. If you need further information do not hesitate to call Eva on 02 9327 4757. If you would like us to mail you a brochure please use the contact form below. For two weeks you will stay at the 4-star Superior Luxury Hotel Carbona, in a central location, offering exceptional cuisine, wonderful spa facilities, 25m swimming pool, and its own thermal bath built in the Roman Style. Relax and rejuvenate with 33 spa treatments (each lasting 20 minutes). Rooms feature wi-fi as well as your own personal bathrobe. Enjoy a daily buffet breakfast and dinner, and find out why Europeans are so keen on their spa holidays. The picturesque town of Heviz is full of cafes, shops, a farmers market, museums, churches and beautiful gardens and is steeped in music, culture and art. 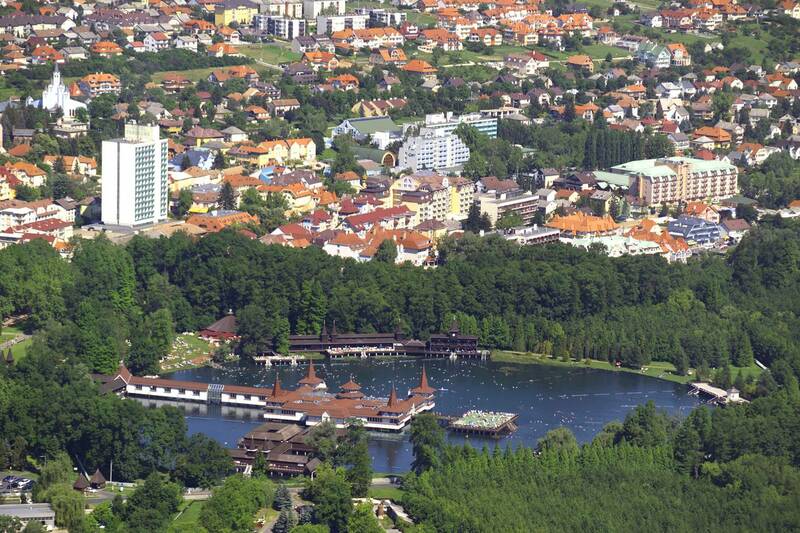 After taking a dip in its magical lake, take a walk around and discover what else makes this town so special. The last stop will be in one of the Europe’s grandest of capital cities. 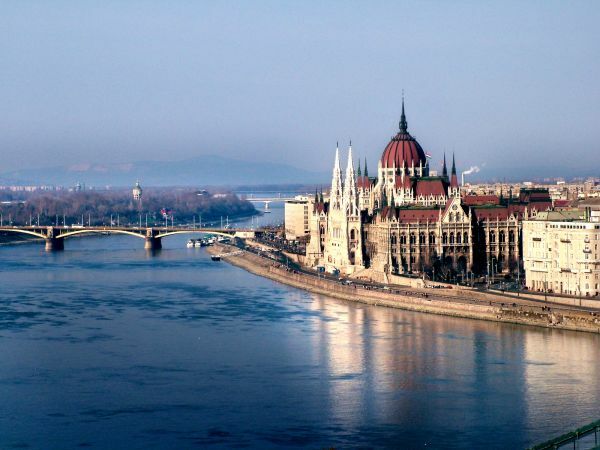 Stay on the picturesque Margaret Island on the River Danube in the heart of the city. Enjoy daily buffet breakfast and dinner, a sightseeing tour of the city and unforgettable evening cruise with drinks. Total cost of the tour includes: Qatar air fare to/from Australia, 7 Nights Ocean view cabin on MSC Bellissima, Flight Genoa - Budapest, 14 nights in Heviz with daily breakfast and dinner, health check, 33 spa treatments and use of all hotel spa facilities; two nights at Hotel Thermal Budapest with daily breakfast, dinner, sightseeing tour and cruise. All European transfers with the group. Airport, Port and hotel tax. To download booking form click here. If you have any questions, please feel free to contact us. Contact us now for the experience of a lifetime!